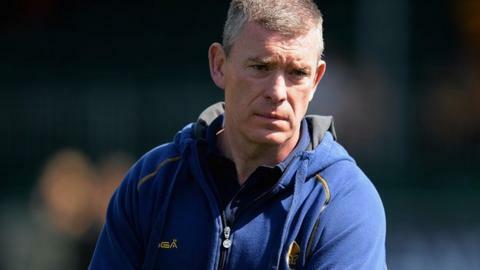 Worcester Warriors head coach Dean Ryan says his side can still improve despite earning their first bonus points win of the Championship season at Doncaster. Two tries in the first 10 minutes from prop Ryan Bower and San Smith earned the Warriors a 12-0 lead. But it was not until the 68th minute, with flanker Sam Betty's try, to add to one from Max Stelling, that Ryan's men felt they had the game won. "We're still not playing as well as we would like," he told BBC Sport. "But you have to get jobs done and a bonus point with the rain coming at us in the second half is probably as much as we can expect. We just feel a bit frustrated that we can't get any momentum in games." Stand-off Ignacio Mieres kicked 13 points - two conversions and a penalty. Worcester's season so far . . . But Ryan's main praise was for young full-back Ben Howard, who again deputised for "not fully fit" England full-back Chris Pennell. "Ben Howard was outstanding again," Ryan told BBC Hereford & Worcester. "He's a young lad coming in and taking his chance really well and he looks really mature. He looked very composed at the back. "And it was nice to see Max Stelling take his chance. Ben and Max seem to have something a bit extra at this level so we're going to keep pushing them in. Some of our other lads haven't necessarily found that little bit extra to beat a man and give us an edge." Doncaster: Jarvis; Flockhart, Clark, Armitage, Lewis; Lennard, Palu; List, Hunter, Quigley; Challinor, Hotson; Makaafi, Hills, Shaw. Replacements: Davies, Bergmanas, Davies, Phelan, Eggleshaw, Bulumakau, Bravo. Worcester: Howard; Smith, Grove, Symons, Biggs; Mieres, Mulchrone; Bower, Annett, Schonert; Percival, Sanderson; Williams, Betty, van Velze (capt). Replacements: George, Daniels, Rapava Ruskin, Cox, Arr, Eden, Stelling.